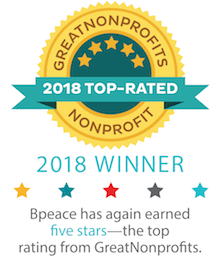 So much of Bpeace's work happens virtually or long-distance, that an event that brings Bpeacers and their families and friends together, across state lines, is very special. Team PwC included seven riders from the company's offices in Chicago and New York, some of whom had never met each other. PwCer Josh McLane recruited his mom, Nancy, from Pennsylvania and his cousin, David Hopkins, who flew in from California.Bpeacer Paula Wilbert from Cape Cod rode with her husband, Tony Espinoza, and their daughter, Olivia. Laura Fedoryk volunteered with her mom, Linda Kruse, from New Jersey. It was a family affair for Bpeace staffers, too. Chief Program Officer, Marla Gitterman's husband Dan Sherman rode, with daughter Ruby cheering him on. Our Donor and Member Relations Manager, Lauren Hass, the grand orchestrator, enlisted her daughter, Samantha, and her sister, Diana Binger, as volunteers. Extreme Bpeacer Donna Fleetwood drove up from Pennsylvania with friend and first-time rider Teresa Hower. This was the third Pedal for Peace for Bpeace Board Director Liz Wald and her friend, Jane Bieneman. Bpeace Executive Council member Monica Sanz rode with her partner, Naomi Moland. Bpeacers riding for their second year included Joe Castor, Nazifa Danishgar and Rachael Rho. First-time Bpeace riders included Drew Crail, Kulpreet Khanuja and Lauren Leland. It's so gratifying that Pedal for Peace even resonates with people who aren't involved in Bpeace day to day. Out of 50 riders, 34 were not Bpeace members! Pedal for Peace has always been the vision of Bpeace Board Director Mary Ciampa, and an unintended positive consequence of her dream is the bonding that occurs among riders during the many meals and fun times shared the evening before, and the afternoon and evening of the ride. Co-chair Jamie Mittelman leading the way. This year's Co-chair was again the enthusiastic Jamie Mittelman, joined by what Lauren Hass describes as one of the best event-planning teams ever--Laura Fedoryk, Jessica Grandchamp, Justin Kitchens, Enrica Maffucci, Josh McLane and Paula Wilbert. Jess slept for only about five hours before making the drive from Boston with her two friends, Ali Beliveau and Jay Hastings, and all three started at 6:00 AM organizing bike rentals. A shout-out to Justin Kitchens, Jacqueline Farinella and Tim Chezar for taking the time to mark the route in advance so no one got lost this year. 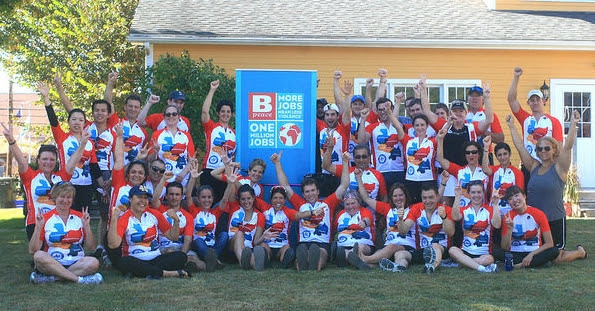 More hard-working Bpeace volunteers included brand-new Bpeacer Patricia Ritchie, plus Stacy Dworkin, Kate Pedersen, Sarah Rappaport and Mittelman crew members Aaron Becker, Isaac Lamell and Olivia Hunter. Special thanks to our sponsors: WAGs, The Vitamin Shoppe, ROAR Sports Drink, LARABAR and our host, Barrington Brewery. Other friends and family of Bpeacers riding in Pedal for Peace included: Aziz and Yasmine Ahang, Danny Boller, Christina Foyo Cardenas, Gerald Chertavian, Katie Clark, Paula and Chuck Deluga, Michael Dunn, Amy Stern Gottesfeld, Jordan Less, Bev Low, Michael Marcal, Matt Medeiros, Nancy Rappaport, Jennifer Rose, Michelle Tan and Kit Yeow. Marla's husband Dan, left, and the rest of the strong souls lining up at the 60-mile start. Get a head start on next year's fun. The 2015 Pedal for Peace will be Saturday, September 26, 2015! If you're interested in riding or just learning more, let us know here. Thank you to everyone who made this one of Bpeace's most lively, profitable and enjoyable events.